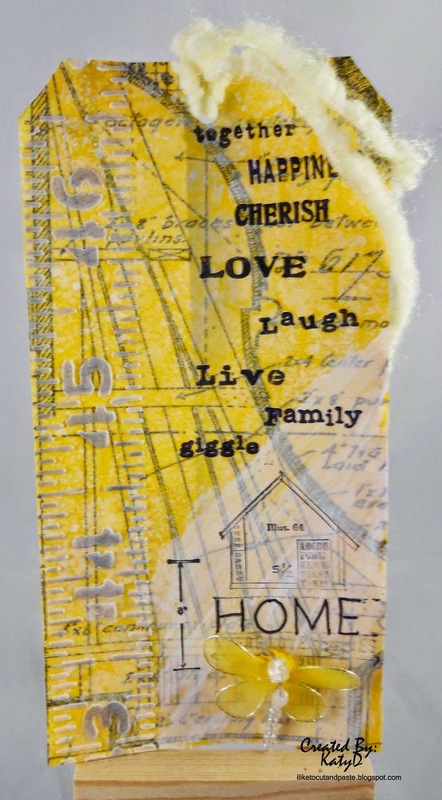 I just finished a tag for the Not So Mellow Yellow Challenge at Simon Says Stamp Monday Challenge. All of the designers have done a great job with their projects-it's really hard not to be inspired! So I made this tag. I glued a piece of Tim Holtz tissue paper down on the tag. Once dried I painted mustard seed (yellow) distress paint over the top. I spray it with white Dylusions to lighten it. I used Tim's ruler stencil and once the light modeling paste dried I put weathered wood distress ink over it. It's so funny how the tag can kind of take on a life of it's own. So from there an architectural feel started happening. I painted a spot of gesso so I could use a Wendi Vecchi stamp and it wouldn't keep as much with the background. But I didn't get the stamp inked well. :( But it's ok. Then I stamped the words above the house as to me those are all things that describe a home. I glued a yellow dragonfly to the the bottom corner. Love the tissue tape background and the touch of gesso! Beautiful tag! Fabulous design. 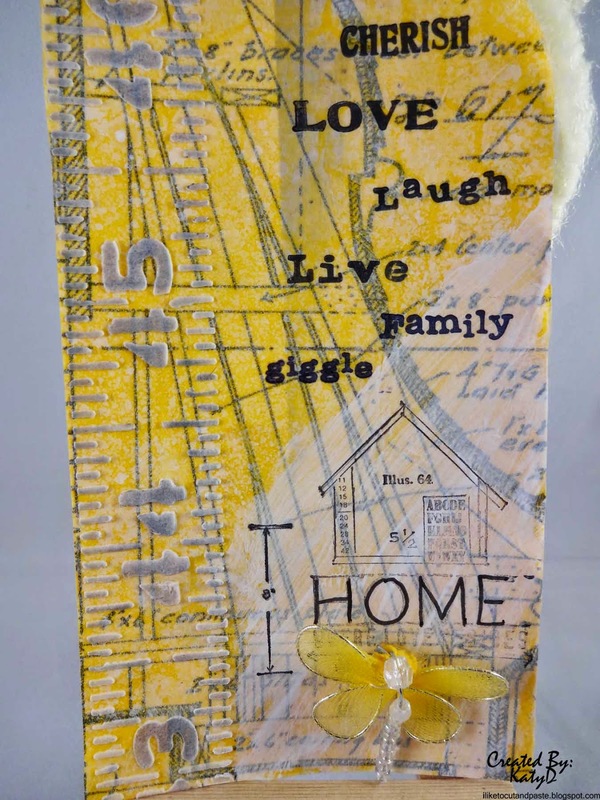 Thanks for playing along with us at Simon Says Stamp Monday Challenge Mellow Yellow! Gorgeous! LOVING the yellow and the butterfly!!!! Love the architectural feel of this and the dragonfly is an inspired addition! Such a pretty tag. Love the yellow! !